The Tablas are the king of hand drums in Northern India (Hindustani music) and throughout Southern Asia. They are also my personal favorites. The name Tablas is used to describe two drums, but in reality, only the wood drum is the tabla. The larger, metal base drum (often made out of Nickel or Copper) is called the Bayan or Dagga. In fact, the smaller Tabla drum is also called the Dayan. Each drum has a raised black dot called a Gab or Shyahi, made out of iron filings mixed with plaster of flour ingredients. Each manufacturer has his own formula, so that the compositions of these patches or dots differs throughout India. On the Tabla drum, the dot is placed directly in the center and on the larger drum, it is set approx. two inches off center. A small hammer is used for tuning the drums by either hammering along the rim or on the wood blocks around the side of the drums. The drummer tunes The Dayan to the key of the Raga, called the Sa. Generally, professional Tabla players will carry more than one Tabla drum, to accomodate the keys that they will be performing in. There is a tradition of names for all the different Tabla strokes (called Bols.) These can be sung by the drummer. 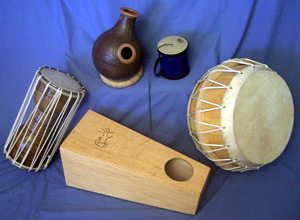 Examples of some of the Bols for the Tabla drum are "Na", "Ta", "Te" and "Tu". For the Bayan, they are "Ghe", "Ga", "Ka", "Ke" and "Kat". When both drums are played together, the names of the Bols always start with Dh, like "Dha", "Dhin" and "Dhe". This drum is very similar to the African Udu drum. It is mostly used in South Indian music along with the Kanjira. Like the Udu drum, this is made out of clay or ceramic and can come in a variety of sizes. Most of the rhythms are played by slapping the hands on the side, but occasionally, for accents, the player can partially cover a hole on the top with his cupped hands in varying degrees to create different, lower, "woofing" tones. The Dholak (right side of photo) is a popular two-headed folk drum. The treble head has no "dot" (Gob) like the tabla, thus it does not give an exact tone. The heads are attached with rope and tuned with rings along the side of the body. This drum is used mainly in the folk musics of Rajasthan, Pakistan and Afghanistan. This drum (left side of photo) is used primarily in South Indian (Karnatic) music. Usually only about eight inches in diameter, this is possibly the smallest drum in the frame drum family. Traditionally made with a lizardskin head, it has just one jingle or zil on the side. This drum is usually paired up with the Ghattam drum (see #3). This chalice-shaped drum (along with the Indian tablas) is considered one of the most expressive of all drums. Usually made out of mulberry or walnut wood, it is the preeminent drum in Persian (Iranian) music. Good players can illicit three distinct tones from quality drums. Along with various finger rolls, the rhythmic variations are endless. This drum is the king of all Arabic drums. Doumbeks are made out of ceramic or metal. Traditional drums have a goatskin head. The drum can be played upright between your legs or laying horizontally across your left thigh. Though not a large drum, the Doumbek has lots of volume and many different tonal characteristics. Most of the bands throughout Egypt, Lebanon, Syria, Iraq and Turkey feature the Doumbek, and our Western ears tend to associate it with belly dancers. Frame drums are more widely represented throughout the cultures of the world than any other class of drums. Their distinguishing feature is that the heads are larger than the bodies, which gives them a "pancake" shape. This Persian frame drum (top center) is used extensively in Sufi religious music and different folk musics throughout Iran. There are many rings attached to the inside of the frame which give the drum its distinctive sound. Until the 19th Century, the Daf was Iran's main rhythmic instrument. The Zarb or Tombak replaced it in classical music in the 19th Century. The sound of this drum (lower right) is very similar to the Western snare drum, due to the strings that are touching the drumhead inside the shell. This creates the characteristic buzzing sound. Unlike the snare drum, the Bendir is played with the hands. This is the Arabic tambourine (lower left above, close-up on right). The brass jingles, or zils, are much larger and heavier than their American counterparts. Playing techniques are more refined than the traditional Western way of hitting your thigh with the drum. The riq can either be held in the left hand as the right hand plays different rhythms on the head and the zils, which is called cabaret position, or it can be gripped with both thumbs and played with refined muting and clear tones with the index, middle and ring fingers, which is called the soft position. The Muzhar(upper right) is a very large Egyptian tambourine with huge zils on it. The head is traditionally made out of donkey skin, but this one has a tunable plastic head. This is the main drum used in all styles of Celtic music (upper left). Traditionally made with a goatskin head and a crossbar in back for gripping. The rhythms are played with a small stick. Bodhrans can be as large as 26 inches in diameter, which is about as big as frame drums get. 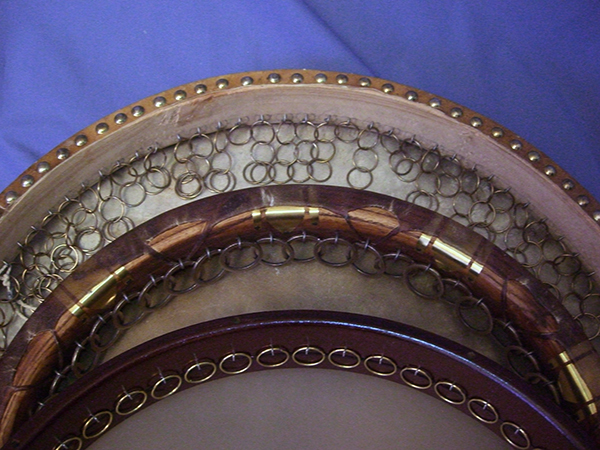 These two (center and third from bottom) are frame drums with goatskin heads and different types of ring jingles attached around the inside of the frame. 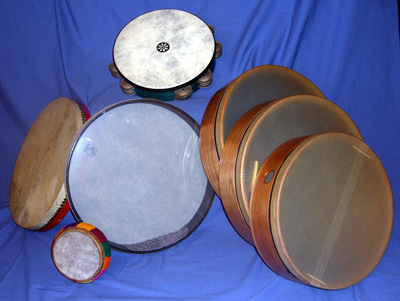 This drum looks like a large American tambourine (center left), but due to their shape, the jingles are not as pronounced, making it ideal for the Brazilian samba and bossa nova. This two-headed drum (center in photo) is a modern invention which lets you approximate the sound of an ocean surf by slowly allowing the beads to roll across one of the drum heads. These three drums (right side in photo) are all made by Cooperman Drums. They are hybrid drums with the ability to raise the strings that, when touching the drum skin make the drum sound like a Bendir (see description above.) When they are raised, the drums sound like the Middle-Eastern Tar. This Riq (top in photo) was designed by percussionist Layne Redmond and is essentially a larger-than-normal Riq. This colorful little drum (bottom in photo) is somewhat unique as far as frame drums go. The back is closed except for a hole in the middle. When played, you cover and uncover the hole with the hand that is holding the drum. This creates unusual tonal effects. This drum (left in photo) is similar in description to the one above from Azerbaijan. Here is a close up shot of the rings on three frame drums. The Persian Daf is on top, the Uzbek Doira in the middle and the Persian Dayereh on the bottom. 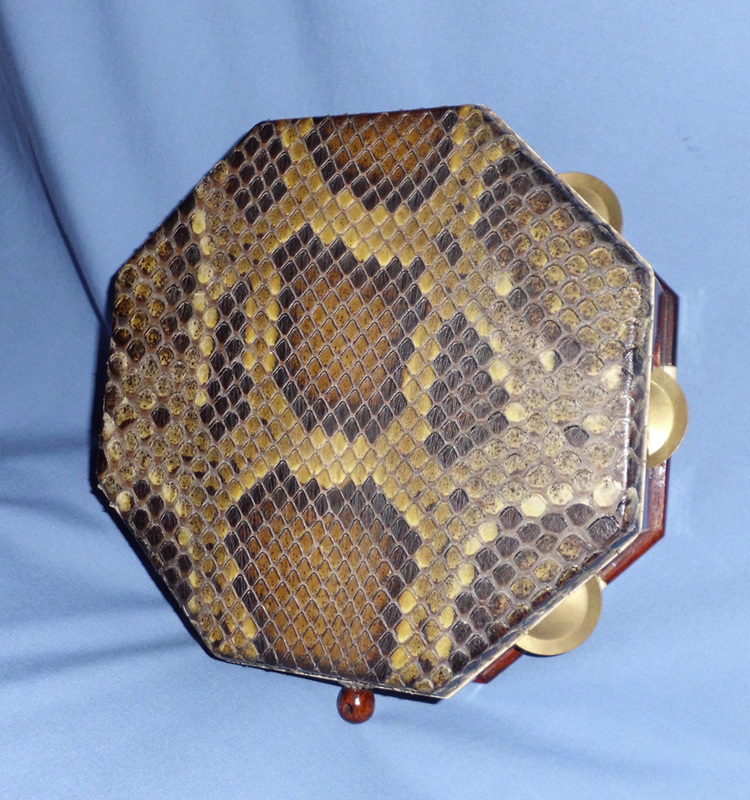 Central Asian hand drum with python skin. Wancara (left side of photo), are traditional Andean bass drums, still have the hair on the cowhide to muffle the sound. The Wancara is played either with sticks and/or with the hands, the Bombo with sticks only. The African Talking Drum (left in photo) can be made out of wood or metal. The hourglass shape allows the player to squeeze the ropes against his body as he holds it under his arm. By doing this, he can drastically change the pitch as he plays rhythms on the drumhead with his hands. The Udu drums (upper left in photo) are very similar to the East Indian Ghattam drums (see description above.) They come in many shapes and sizes. By opening and covering the holes, while hitting the sides, the player creates a variety of sounds. This blue drum was designed by Remo Percussion and can be played as a hand drum or you can create unusual sound effects by swirling the drum, which sets the spring in motion, and then with your free hand cover and uncover the hole on the side of the drum. They make them in three sizes. This is the medium size. A traditional two-headed drum (right in photo), which can be slung over the shoulder and played with drumsticks but I like to play it on my lap with one hand on each side. This is another contemporary drum (bottom in photo) designed by Rhythm Fusion, which is played horizontally on your lap like an Indian Dholak (see above.) However. this drum has no skin but still creates distinct high and low pitches between the two sides. The other effects are created by using either hand to partially or fully cover the hole on top. The Berimbau originated in Angola, Africa, but now is predominantly played in Brazilian music. This bow-and-arrow-shaped instrument traditionally had a dried vegetable gourd attached to it. Modern instruments can have gourds made out of fiberglass, like the one pictured. The gourd can be moved up and down the bow to change the pitch of the single string. The Berimbau is held with the open end of the gourd against the player’s body. In one hand, the player holds the instrument and a large coin, which he uses to touch the string to vary the pitch. In the other hand, he holds a stick and a shaker. Rhythms are created by hitting the stick against the string, which also sets the shaker in motion, touching the string with the coin and then moving the gourd on and off the player’s body, to change the timbre. These instruments are nothing more than a wooden box with a hardwood top. These can be played with mallets or with the fingers. 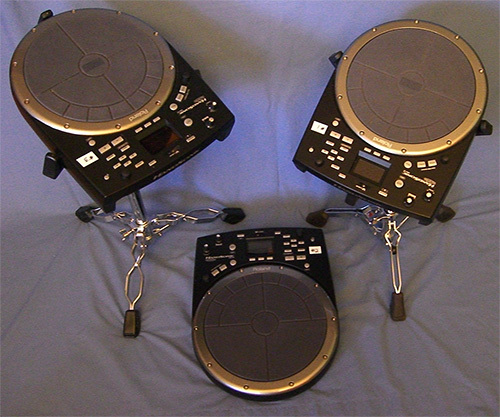 The Kay Undo Pro drum (top in photo) is a hybrid instrument made by KLANGspiel in Germany. It has elements of the Cajon, Udu and Bongos all in one drum. Played on the lap. 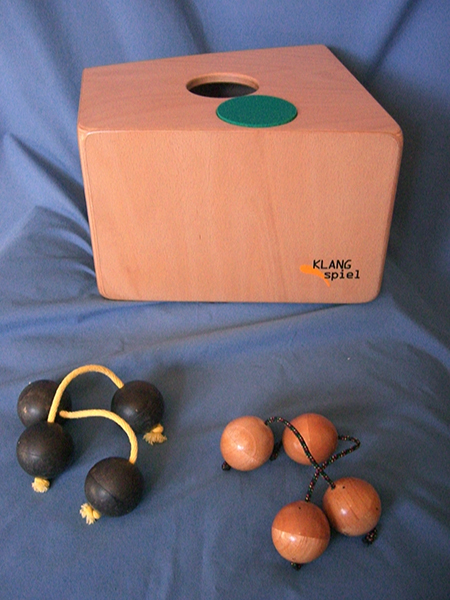 The Asalatos (bottom in photo) are played one per hand, where the player, shakes, flips the balls and bangs the balls together to create different rhythmic patterns. Amazing to listen to and watch! Check out "PANMAN ASALATO in Jungle". The Cajon, which doubles as my performance seat, is a drum that is believed to have originated in Peru. It is common in the music of South America and Spain. These days, it is very popular in Flamenco music. The box in the picture is the Cajon. I have added a number of available accessories. 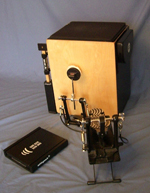 The Gibraltar Cajon Pedal is mounted on the guitar footstool to the right in the photo. It acts like a bass drum beater on the Cajon. On the floor next to it is the Schlaghwerk Side Kick, which can be mounted on the side of the Cajon, or as I am using it, on the floor. It produces a bright, metallic tone. To the left is the Schlaghwerk Heck Stick, which gives a bit of a tambourine sound with an adjustable jingle resonance. On the right, mounted on the Cajon, is the Meinl percussion device which imitates a snare drum. These are the latest addition to my recording/concert set-up. Each of these contains hundreds of very natural-sounding percussion and percussive effects. 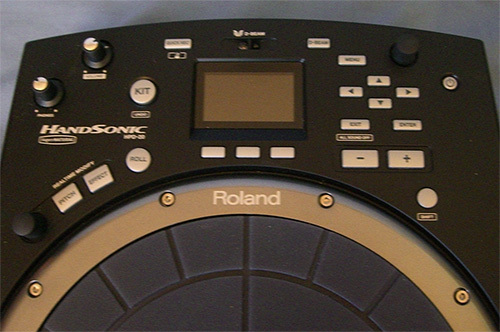 The touchpads have 13 sections, with each creating a different hand-percussion technique. As you can see in the picture I have two on customized snare-drum stands on either side of me and one on the floor in front of me. Tuned metal bowls from Tibet and Nepal, traditionally used in meditation. The sound is created with a wooden stick by striking the edge or swirling around the outside of the rim, to create a sustained note with a slow crescendo, similar to the technique of running your finger around the edge of a glass of water. 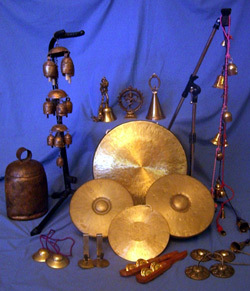 This is a collection of percussive and ambient gongs, bells and Tingshaws. Most of these can play both roles. All of them can be played similarly to a regular drum as well.